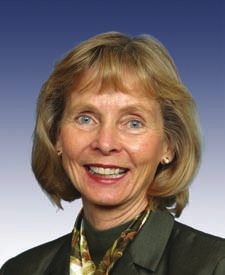 With just months left in her final term in office, Rep. Lois Capps has thrown her support behind a Chumash tribal proposal to create a national marine sanctuary ranging from Cambria to Santa Barbara. The National Oceanic and Atmospheric Administration (NOAA) is currently considering the request. The marine sanctuary proposal is intended to protect the ecosystem off the Central Coast, a portion of which is sacred to the Chumash. Fishermen have opposed the idea, saying it would lead to more fishing regulations and harm the local fishing industry. Capps said she is sending a letter to NOAA requesting the agency act on the pending application for the sanctuary. On Monday, Capps held a press conference at the Pismo Beach Pier to announce her support for the marine sanctuary proposal. Supervisor Bruce Gibson and San Luis Obispo Mayor Jan Marx, as well as Chumash tribal leaders joined Capps in calling for marine sanctuary designation. Last October, the Chumash proposal was added to NOAA’s list of successful nominations. That is the first step toward becoming eligible for marine sanctuary designation, Capps stated. Before the sanctuary designation occurs, officials must draft a management plan for the area and allow the public to review it. There are currently 14 national marine sanctuaries. The Chumash proposal is located in between two of them — the Monterey Bay National Marine Sanctuary and the Channel Islands National Marine Sanctuary. Goodbye Lois, thanks for nothing. The Democrats rule the country now with Hilliary becoming prez. Republicans will have huge losses in Congress and nothing can stop the tsunami. In short, we are screwed. More government control and a jobs killer…sounds about par for the course. The more people on welfare and food stamps, the more government likes it. Of course she backs it….it’s easy. She may or may not back this and we likely will never know for sure. As with all her positions, we all know they are not necessarily her positions but the positions of Democratic power players, they just tell Ms. Capps how to vote and what to support and she does as she is told. Is she still alive? Her photo looks like a shot of a wax museum dummy. Have you ever heard her speak unscripted or try to answer a question? Her brain is that of a wax museum dummy. I honestly could not believe how stupid she is. Then again, voters must be more stupid. Isn’t she gone yet? Who cares what she wants, what or who she supports without the approval of Nancy Pelosi, or anything else. Just color her gone, sooner than later! Right!!! Who cares what she wants! She also backs drunk driving and vehicular manslaughter. As I understand it, this new Sanctuary will not entail any new restrictions on fishing. It would prevent offshore drilling (better for fishing) , so expect oil industry TROLLS to post lots of negativity on this one. There is plenty of time for public review and comment before the project goes through. It will protect our tourism income and the overall health and beauty of our coast. I would also imagine we could get Federal help should anything go wrong or in the event of necessary actions due to rising sea levels. Anyone who lives along the coast knows that is a looming problem. Foremost in my mind is the fact that there is now more plastic than life in the ocean. That is a act that I find both horrifying and deeply embarrassing. We need to do what we can to preserve all the life we possibly can, so as not to bequeath a dead planet to the future. It sounds like you have drunk the environmentalist Kool-Aid. This is the camels nose under the tent. Once they get their foot in the door the regulations never stop. This will spell the end to our local fishing industry. No doubt remains that Green is the new Red. project that is proposed for the area. The Avila Pier will be one of many projects that will double in cost if this is approved. Also, the Salinians claim that Fred Collins, the one making the proposal, isn’t even a Native American. It is my understanding that they are against the sanctuary as currently proposed. LOLOL!!! it’s almost as though Franfresca made up the whole plastic VS wildlife thing just so she could somehow squeeze “Bequeath” into a conversation…Really… who says bequeath? Perhaps you can dazzle us with some supporting documentation to back your fantasy. Would this mean the oil drilling platforms currently in operation in the Santa Barbara channel would have to stop production? I disagree with your comment that “no drilling makes for better fishing. In fact, The fishing around these man-made structures can offer incredible diversity, depending upon the season and time of day when you visit them. Once the habitat on one has had the chance to fully develop, it becomes a virtual fish magnet. Your last name is close to Bologna which is what you are full of. That is about the stoopidest comment I have ever seen. Typical of the hysterical environmental-worshipping crowd. I love marine life. I really do. I want to protect it when REASONABLE. How many taxpayer funded environmental programs CAN WE AFFORD? Honestly? We already have TWO sanctuaries on the coastline. How will this be funded? And HOW can those waters be protected? How to we keep dirty stuff from Japan from getting into our highly taxed sanctuary waters? Do we employ environmentalist with life preservers, a boat, and a REALLY long pool cleaner to float along and do debris clean up? Maybe the Fish Masters need a new Gig……. Francesca, it would appear those who have been critical of your opinion here are incapable of Googling a topic or researching a subject on their own. Folks who are interested in the Sanctuary can go to this website to learn more: https://chumashsanctuary.com/ and http://sanctuaries.noaa.gov/news/press/2015/rec-fishing-california.html … Among so many others! Resentment to environmental research, findings, name-calling, not knowing how to Google something, is becoming the standard for Cal Coast News commenters. They have become the caricatures Adam Hill shakes his fist at the moon about in an attempt to change the subject, In every case having to do with the degradation of our shared natural resources, there are special interests at work. The local commercial fishers oppose the Sanctuary because they want to set the value of the shared resource on their own, they want to dictate which research is worth doing, which species are more important than others, they want you to believe the status of a healthy ocean can be based on how many $’s they can extract from it. But, there is so much more to it. Most people understand that leaving these decisions to Industry is not a good way to protect a vital, shared resource.. We need to support opportunities to learn more about risks to our oceans. That is one reason a growing number of citizens are expressing their support for the Chumash Heritage National Marine Sanctuary. Most people understand that blindly allowing government to “handle it” is not a good way to protect a vital, shared resource either. This needs to be treated like a business plan. Lay it out in easy to understand language with the background information, research, projected costs, etc. I am not required to “Google” the information. I am a taxpayer being asked to support and fund a project; therefore, am entitled to a business plan on how this pla will be managed. Instead of we fishing for tunas the Chumash can fish for dollars while creating a bountiful habitat from their floating Casinos.